The effort by various Dalit organisations to redefine the caste system as a form of racism and get the redefinition endorsed by the United Nations (UN) has opened a Pandora's box of anthropological controversy. While the government has opposed the whole concept as unjustifiable, it has been hijacked out of the ambit of anthropology and into the political arena: the broad political opinion is opposed to the notion of caste and racism being kissing cousins, ostensibly for fear of getting India a questionable reputation. 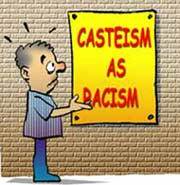 do with physical attributes, unlike the caste system,"
Bardhan expresses his scepticism about any caste specific activity by UN by saying that "even if caste is equated with racism, can you run away from the fact? Even if it is recognised by UN, it will only mean endless debate without achieving anything fruitful. "as it is based on notions that some people are superior and others inferior". Dalit Human Rights, explains that the term "descent" used in Article 1 of the Convention of the UN against Racism does not solely refer to race. The question is - does the present reality add up to a damning case against caste? Weighed in terms of the benefits that freedom brought Indians, the Dalits are still a deprived community in India. Bardhan says - anthropologists would say simplistically - that the claim of the Brahmin caste that it belongs to the Aryan race has been disproved by the fact that most South Indian Brahmins belong to the Dravidian race. He points out that even B R Ambedkar, the most prominent Dalit leader and crusader, refrained from equating caste with race in his definitive analysis of the caste system. "Do you mean to say that all the various castes belong to different races?" asks Bardhan. it is electorally imperative, we will not take up the issue." When pressed further, he admitted, "Sensitivity to such issues is limited to electoral pressures." that the issue of Dalits is not about names and renaming "but about discrimination". Khan points to the fact that the emancipation of Dalits from oppressive social stigma remains a distant dream. The most important concern is the lack of avenues for upward mobility for most of the 160 million Dalits in the country. Legislations which are meant to protect Dalits, like the Prevention of Atrocities against the Scheduled Castes and Tribes, are rarely implemented, says Diwakar. Also read, Is Caste Racism or What?